Well, bless your beautiful hide. DOES NOT CALL FOR A CANDY THERMOMETER. I hope you’re not too crushed or anything. thing going on with candy thermometers. And so darn addicting, tasty, heavenly, fall-ish and candy bar using. Just giving you fair warning, Halloween is soon. Very soon. I thought you might like to have a recipe handy to use some of those tasty chocolate bars up. Make this yummy treat soon, my friends. 1. Pop yourself 16 cups of popcorn. 2. Into a medium sized glass bowl, or large glass measuring cup, place the butter, brown sugar and corn syrup. Heat it in the microwave for 1 minute. Stir the ingredients together with a wooden spoon. Repeat this step four more times. and a final “heat and stir”. It should be very bubbly and hot at this point. 4. Pour the popcorn into a large brown paper grocery sack. 5. Pour the caramel right into the bag on top of the popcorn. Stir it around with a wooden spoon. 6. Fold the bag over and place it in the microwave, heat for 1 minute. Take the bag out of the microwave and shake it….shake it…..shake it. 7. Return the bag to the microwave and heat it for an additional 30 second, then shake it again. 8. Pour the caramel corn out onto a large jelly roll pan, lined with parchment paper. 9. 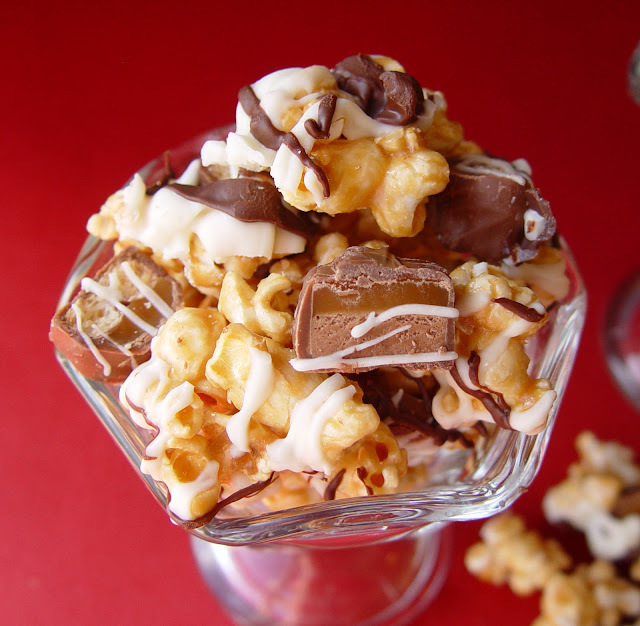 Chop up the candy bars and lay them out over the caramel corn. 10. Heat the white chocolate chips in the microwave, for 30 seconds at a time, stirring after each heating interval. Don’t let the chocolate get too hot. Add 1/2 t shortening to the melted chocolate and stir to combine. 11. 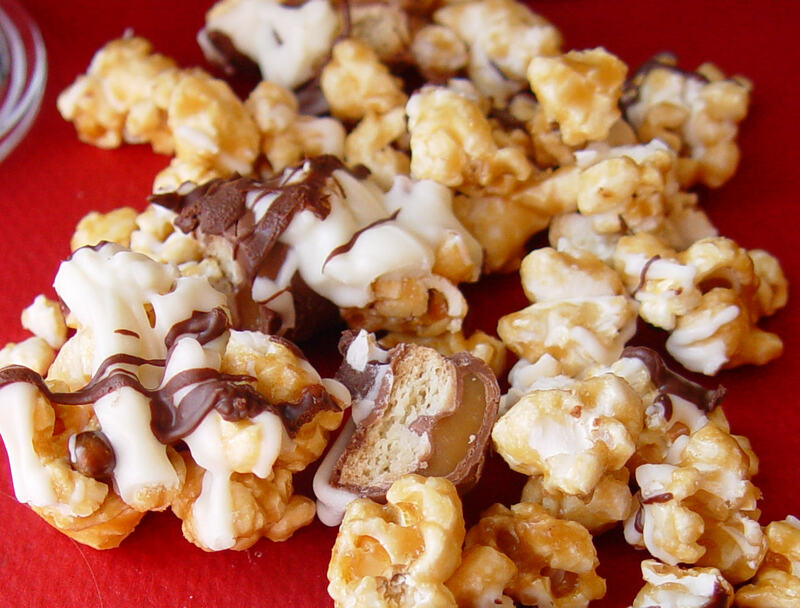 Drizzle the white chocolate over the top of the caramel corn and candy bars. 12. Melt the semi sweet chocolate just like you melted the white chocolate. Drizzle it over the caramel corn. 13. Let the chocolate set up (you can pop it into the fridge for 10 minutes to hurry along the process). Break it up into chunks and serve. Store any leftovers in an air tight container. I LOVE your blog. I have recently discovered it and I have made quite a few of your recipes. My current favourite is your lemon cookies with white chocolate chips. All the people on or team here at school also love it, they more than help me demolish a tupperware of cookies!!!!! I live in Lebanon in the Middle East so sometimes we struggle to get all the things that you have in the States. When I saw white choc chips in the shop I grabbed them because it is so much easier than chopping up white cooking chocolate! This caramel corn looks so yummy – I will be trying that very soon. I think I love you. (In a blog-crush kinda way…I'm not some creepy internet stalker freak.) This looks BOMB! BTW, I made your Broccoli Cheddar Soup a couple of nights ago and presented it with much trepidation to my non-cream-soup-eating husband and self-avowed hater of all creamy soups and sauces. Actually, there was really no trepidation involved. It was more, “Here's dinner. And if you don't like it, there's the door and some cash.” 😉 Anyway, he LOVED it and wouldn't shut up about it. Now I have to make it again. Good thing it's super easy and fast. My new most favorite blog for food. Awesome. I'm tellin' everyone about you. Sadly, I know all of 4 people in the world. YUM! I have to make this. Oh yum! I have done the microwave caramel corn before, but I never thought to add the chocolate and candy bars. I can't wait to try this one! Holy Halloween candy ! Does this look amazing. Something fun to take to my VT ladies. Thanks so much. You are awesome. This looks “to die for”!!! So easy – no candy thermometer – YAY!!!!! Will be making this very soon. As usual your pictures are beautiful!!!!! I am pretty sure that you and I would be best friends if I didn't live in TN! Maybe I can convince my husband to look for a job in UT…er, on second thought, my in laws live there so maybe not! I'm going to visit my daughter in university in a week and I'm thinking of bringing a pail of this popcorn for her to share with her friends. Where I live (Alberta) the stores don't use paper bags much anymore. Can I stick the popcorn in the oven instead for a while? Thanks for all the great recipes. When you say put shortening in it what does that mean? Yesterday I ruined two 12oz bags of white chocolate chips because I put butter in it. Is that not shortening? Is shortening margarine or crisco? I need to figure this out before I ruin anymore good stuff. I'm not sure how it would work in the oven. I have read a lot of oven bake caramel corn recipes, but all of them start with caramel that's cooked on the stove top…so my first thought is you might have a mess on your hands if you tried the microwave caramel in the oven. However, if you have a oven baked caramel corn recipe you have tried and like, you could use that and then add the candy bars and chocolate once the popcorn has cooled. Good luck! Let me know how it goes. Two whole bags ruined!!!! Oh no. I hate wasted ingredients. That can really put a damper on the day, can't it. Shortening and butter are different. Shortening is Crisco, as you suspected. Better luck next time!! What an amazing treat! My boys are looking over my shoulder right now and begging me to make this for them. I’m thinking that maybe throw in a few nuts – whatever kind you like, peanuts, almonds, pecans, whatever are your faves – would add a nice crunch, crunch and be extra healthy! I mean, isn’t there protein in nuts? LOL! Thanks for the great recipe and beautiful photos! Also, Steph and Karen, I live in New Brunswick and we don’t have paper bags either but I was thinking of putting it a microwave safe bowl and mixing and reheating in the microwave to simulate the paper bag. Probably would have to do it in smaller batches but I think it might work. I really enjoy reading all you say and what others say in your blog, I learn a lot from the comments made. I really think this looks good, have to try it sometime when I can take most of it to a party. Miss not seeing you, thank goodness Thanksgiving and Christmas are on the way so I can see you and your crew. Love ya. Jamie, So glad you loved the caramel corn recipe. It is the best, isn’t it! My kids request this treat over and over – more than any other I think! My son and I made this and we bagged it up for teacher Christmas gifts. They loved it! And we got the left overs…yum!! !